Ever since the Yankees signed Aroldis Chapman to a five-year, $86 Million deal early this week, I’ve read a lot of coverage about the situation. Surprisingly, most of it has been negative. Some–those who haven’t read the actual police reports, looked at evidence or care that no charges were filed and don’t think anyone can ever change as a person–are on their soap boxes about Chapman’s domestic abuse issue from last offseason. Others think the signing is horrible for business reasons. I think this is a good signing, but allow me to explain why. First of all, let’s address the domestic abuse suspension. As you all should know, Chapman was never charged with anything. This was because of a lack of physical evidence, and the fact that no one really saw what had happened between Chapman and his girlfriend. The police concluded that he basically moved her forcefully with his hand to her to get her out of his space and she tripped over a chair and fell. He also may have grabbed her by the neck, but didn’t actually try to cut off her air supply. I’m not saying any of this is OK, nor do I think any of that sounds acceptable. You should never put your hands on anyone like that. Period. No matter how much force you use or don’t use. The fact that it was a woman makes it all the more deplorable. I just want to point out that, according to the evidence and witness testimony, he didn’t punch, kick, throttle or “attack” anyone. I don’t want to downplay the fact that he put his hands on his girlfriend, but I’m all the more concerned by the fact that he, at some point, went into his garage and fired eight gunshots at a garbage can. I know they smell, but that’s why they’re in the garage. Don’t shoot them. All kidding aside, this is a serious issue. If you’re getting angry enough to put your hands on people, and fire random gunshots at things, there’s a red flag that needs to be addressed. If left unchecked, his anger will eventually cause him bigger problems. He might seriously hurt someone, or himself. That being said, I think the facts show a man with a correctable problem, and not a lost cause who should be exiled. I’m willing to give Chapman a chance to prove that this was a one time thing and won’t happen again. I just wish some bloggers would take the time to read all of the facts before judging Chapman, or branding him for life. Also, the Yankees traded for him immediately following the incident. Would they be signing him if they thought he was that terrible person? I’d like to think not. It’s important to stand up for people’s rights, and make sure we’re not supporting abusers, but it’s also important to know what you’re talking about when you get on your soap box. OK. Now let’s talk about the contract, which seems to be most people’s big issue with this signing. I know two things about this deal that make it completely OK with me. First, this contract isn’t for as many years as people think. Second, last time I checked, the salaries of baseball players are not crowdsourced, or paid for with public money of any kind. Allow me to clarify. The main reasons people are using to poo poo this deal are that it’s for too many years, for too much money and for a guy the Yankees aren’t really ready to be buying big on. This has been announced as a five-year deal, meaning Chapman will be making $17 Million per season until his age 33 season–a time when pitchers tend to start really losing their velocity. This could be scary, if you don’t actually get all the information before you panic and head to your blog to frantically write things. This isn’t really a five-year deal. The contract comes with an opt-out after three years. Rest assured that, unless Chapman has a serious injury in that third year, he’s going to opt out. Almost everyone opts out. The only guy I can think of who hasn’t opted out of one of these deals is Scott Kazmir, who had a mediocre year in his first season in Los Angeles, and has decided to stay on for two more years and $32 Million. Kazmir is not Aroldis Chapman. He’s older and far more fragile, and coming off a not-so-good year. I think Chapman will stay healthy and be very good, and then he’ll opt out of his deal because he’ll be just 31 years old and ready to Cash in for far more years. If the Yankees don’t want to keep him, they’ll let him go. If they keep him, it’s because they’ll know he’s going to keep the fastball everyone seems thinks he’ll lose before the ink dries on his signature. Now onto the money. Last I checked, I don’t fund Hal’s player salaries. It appears that Chapman was a guy whom the Steinbrenners really wanted to spend their money on, and so we shouldn’t be mad at them for bringing him in. They’re the ones with the deep pockets. It doesn’t affect us. For those who say the luxury tax situation, combined with Chapman’s salary, will keep the team from going after all those juicy free agents hitting the market in 2018 (Bryce Harper and Manny Machado, anyone? ), I think you need to calm down. The Chapman signing shows that, if the Steinbrenners think a guy will put asses in the seats and Ws on the board, they’re gonna get their guy. Period. It’s always been the case. They spent a ton of money prior to the 2014 season because the 2013 team was a joke. They’ll spend it again if they think they need to. Also, these same poo poo-ers will probably cry that whoever they sign is making too much money over too many years anyway. That’s what people do. As for those who say the Yankees have no business signing a big money closer this season because the team isn’t ready to win yet, you’re right. 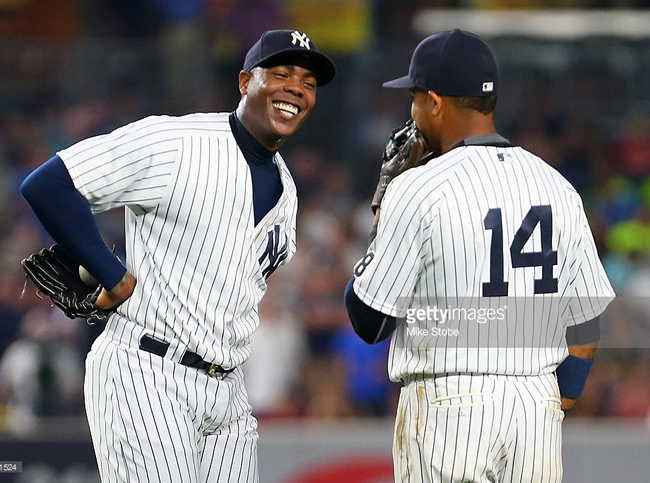 The NWO Yankees probably won’t be ready to fully contend until 2019–Chapman’s final year before the opt out. Their pitching staff is currently a huge problem, so stacking the bullpen might end up pointless. There’s nothing illogical about this line of thinking. Guess what though… Chapman throws 105 mph. If the Yankees aren’t ready to contend anyway, why not sign a guy who is a legitimate draw for the fans? If we’re not going to win as many games, doesn’t having Chapman make every win that much more exciting? Sometimes its important to remember baseball isn’t just a business. Sometimes people need something to cheer about, even when the team doesn’t have a chance to win the World Series. At the end of the day, we’re all entitled to our opinion on this signing. If you don’t like the contract, that’s fine. If you want to judge him based on misinformation about his domestic abuse suspension, that’s fine too. I’m choosing to do my research and use some optimism to judge the contract. Here’s hoping the deal and the anger problem don’t make me regret this article. If he gets arrested again, or suddenly throws 80 mph, I’ll be the first to tell you all that you were all right.